Matt N and Pokemaniac like this. that photo is a great reminder of how utterly Massive this is going to look in this park. Can't wait to see how this progresses. Yeah this ride, alone, is huge. Let alone where its located in the park. It will definitely be the icon of the park next to Phanny. To give it a size reference of how massive this will be. The top of the Aero 360 is about 75 feet and the supports for the stall over the walkway is about 2/3 as high as it will be. Racer is listed at a height of 72 feet which means the supports for the lift on Curtain are 1/3 complete. ^I can only see the left half of the photo for some reason. What's been added? Are you on mobile by any chance, photos never scale right for me either. If you click on the image you can see it in its entirety. See if this works ATI/CrashCoaster. Some extra height and some smaller supports. Coaster Hipster, Hyde, TMCoasters and 11 others like this. Been wanting to make a Kinex reference to this coaster. You beat me to it. Jared and GuyWithAStick like this. 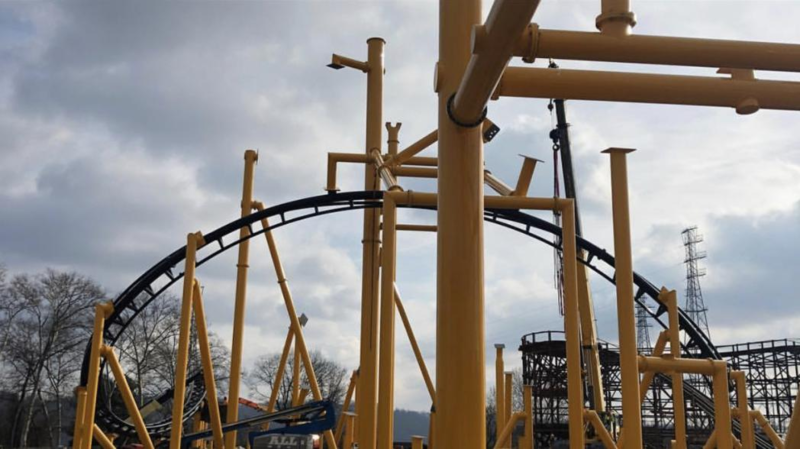 Slightly going off topic, but Taylor also told me he filmed a lot of Maxx Force track, which he said he couldn't tell the difference between that and Steel Curtain's track besides the colour, so the track types are identical, and not that of a Chinese air launch coaster. He also said he won't be releasing these pictures/footage until SFGA shows of the Maxx Force track on their social media, so they can receive the thunder. Snoo, Pokemaniac, Matt N and 2 others like this. Coaster Hipster, Matt N and CrashCoaster like this. Every time I see anything about this ride, I can't help but think the colour scheme is inverted. Why would you want the track to dissapear from sight, but draw massive attention to such a huge, straight frame completely encasing said track? No, I think they made the right choice. When I think about a massive black structure with yellow track it looks worse than what they’re doing. Although honestly neither looks that good. EthanCoaster, Kennywoodfan, b&mfanboy123 and 1 other person like this. You can tell the track has some Premier vibes to it. b&mfanboy123, Pokemaniac, CrashCoaster and 3 others like this.